Micro Preemie Twins: The Story of Holland & Eden: Did I Mention They Can Read? So happy to hear you're home and everyone is on the up-swing. I'm praying this year we stay out of the hospital. ugh. I love the way his face lines up with hers. What a great photo! this is the funniest pic I have seen in a LONG time!!! SOOOO clever!! Greetings from Atlanta, Georgia!! Love your blog!! Kudos to them! Preemies are the most wonderful babies! That is pretty funny how HHDL's face lines up with Eden's. I love that book too. 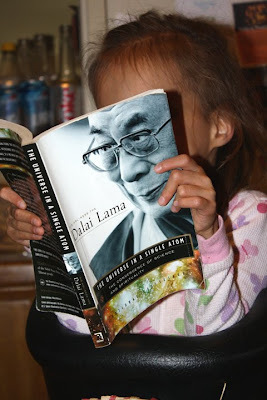 The Dalai Lama is an amazing man and his books impart what a real and brilliant person he is.